Check the press release below for all the details along with the tracklisting for Termanology's "Politics As Usual" album. 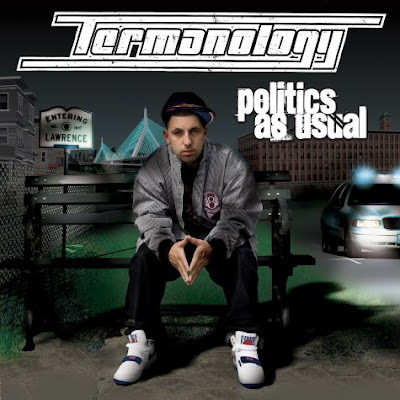 New York, NY - Massachusetts-bred; New York-based rapper Termanology has now finished his official debut album Politics As Usual. One of this year's most anticipated albums; it drops September 30th, 2008 through a joint venture between Term’s own ST. Records and Indy powerhouse Nature Sounds. Termanology’s debut merges the best of both worlds for all Hip-Hop fans, as its meshes classic boom-bap production from a virtual who's who list of production royalty; DJ Premier, Hi-Tek, Pete Rock, The Alchemist, Havoc, Buckwild, Nottz and Large Professor all provide tracks, with Term’s lyricism, swagger and bravado. Boston's Hip-Hop scene with several highly acclaimed 12" singles. At the onset of 2006, Term caught his big break when legendary producer DJ Premier, whom he met three years earlier, finally blessed him with one of his signature, scratch-laden beats. "Watch How It Go Down" instantly became an underground classic and Termanology appeared on Hip-Hop's international radar. The conscious hood anthem garnered the earnest MC tons of praise, landing him in The Source's "Unsigned Hype" and XXL's "Show and Prove" columns. route to have total control of everything related to my project," Term explains. Nature Sounds is quickly becoming the indy home for classic hip-hop. During the last couple of years the label has released projects by several artists that include hip hop cult icon MF DOOM, Wu-Tang's Masta Killa (Made In Brooklyn), the debut album from Havoc of Mobb Deep (The Kush), most recently, Pete Rock's latest (NY's Finest). Term has already set things in motion for his debut, Politics As Usual, with the recent leak of the LP’s buzz-single, How We Rock,” which has the Internet buzzing and features Term rocking with two of Hip-Hop’s most beloved individuals, Bun B and DJ Premier (who produced “How We Rock”). Term has also shot a video for “How We Rock” and the video will be released to the masses shortly.